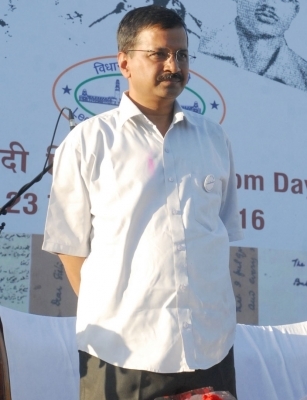 New Delhi Sep 16 (IANS) Delhi Chief Minister Arvind Kejriwal on Sunday took a jibe at Prime Minister Narendra Modi and Congress President Rahul Gandhi for visiting mosques and temples. "Rahulji is visiting temples Modiji is visiting mosques. Nation building can t be done by going to temples and mosques but by providing schools hospitals roads electricity water to the common people " Kejriwal tweeted. "Higher education institutes and world class research institutes are the temples and mosques of the 21st century " the Aam Aadmi Party leader added. Recently Modi attended the â€˜Ashara Mubaraka - commemoration of martyrdom of Imam Hussain at the Saifee Mosque in Indore Madhya Pradesh where Assembly elections are due this year. Rahul Gandhi embarked on the strenuous Kailash Mansarovar Yatra this month.